I recently had a funny Facebook conversation with a fantastic cousin-in-law turned friend where she poked fun at Mike & me for driving a Land Rover. Why do we hate Nature? she asked. Oh, my. It's funny how sometimes you see yourself very differently from how others view you, isn't it? I wouldn't consider myself a full on hemp-wearing, bathing-in-streams hippie but I love the term Conveniently Crunchy (a friend from my college days coined it and I think it fits my lifestyle pretty perfectly). I try to make changes where they make sense for us. I love to hang my laundry to dry, except for towels, that is; they still go in the dryer because I like them to be fluffy. I shop at farmers markets for fresh produce- it tackles being outside, eating healthier and reconnecting to my food source all at the same time. Triple Score! I clean most of my house with vinegar and baking soda and I cut down on chemicals where I can. I use coconut oil as a moisturizer (more on the wonders of coconut oil in a later post! Or if you're dying to know right now, our good friend Google can help you out). I'm trying to grow some of my own food but that has not worked out yet. Also, we recycle. A lot. And not just because Germany requires us to. Garbage day on our street. I've only had to prop my black garbage open like that once. "Recycling. I believe in recycling; I really do. I wasn't so great at it at Luke's house, but normally I'm all for saving the planet. Here it's a requirement. It breaks down like this (I think): normal paper and cardboard in the blue bin, plastics/waxy paper/metal/food containers in the yellow bags. Compost in the brown can (or the compost pile in the backyard, but I haven't figured that out yet). Residual garbage in the black can. Sounds easy, right? I've spent more time trying to figure it out than should be required for any reasonably intelligent person. It's helped now that I have multiple garbage cans and am color coding them with electrical tape. Add to it all that garbage day is Tuesday, but they don't pick up all types of garbage on every Tuesday. There's a very convoluted rotation that I haven't mastered yet. And you can't overfill the black bin or you're assessed a fee. You can purchase red bags to avoid the fee, but I don't know what you can put in them or where to buy them or when they would be picked up or if I should take them somewhere, so we don't have red bags. Also, plastic bottles bought on base are recycled with yellow bag garbage but plastic bottles bought on the economy are taken to the place in town to be recycled but they must have the caps on. Don't get me started on glass. We're supposed to do something special with glass, but I have no idea what it is." If you're new to Germany and stopped by this blog randomly, have hope! You will figure this out! It's really not so hard once you get used to it and find a system to help you organize your garbage. The black tape is for true garbage- I rarely have very much of this, it's really just cooked leftovers and a few paper towels, which I'm considering getting rid of in favor of having more reusable cloths. The yellow tape is for anything that is recyclable- and around here, that's pretty much everything. Plastics, metals, styrofoam- anything you think might recycle goes here. You can rinse your food containers if you like (and it's recommended, especially in the summer or if you have animals who will open your bags); sometimes I do and sometimes I don't. 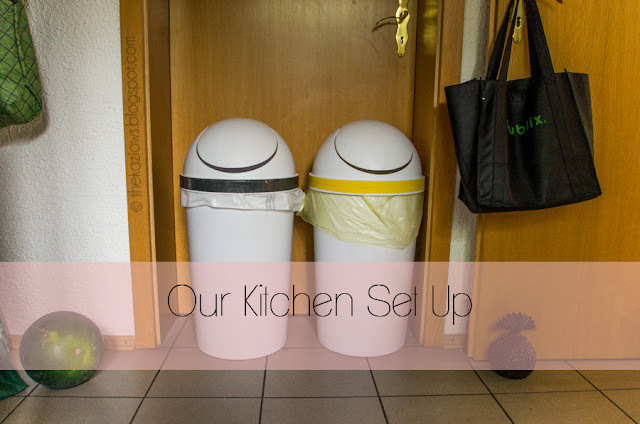 There is also a small garbage can under the sink for raw foods waste (peelings or apple cores, that kind of thing)- this garbage goes into the brown bin outside or to the compost pile. I don't really use this garbage can because I don't like cleaning it. I find it easier to just take the waste outside right away so it doesn't get smelly. I generally use the Rachael Ray trick of putting my raw garbage in a big bowl while I'm prepping and cooking dinner. Then I can just empty it and wash it with no worries and no smell. Pretty boring, right? Simple works best for us. The Publix reusable shopping bag hanging on the door is currently Mike's lunchbox. He doesn't care what he carries his food in as long as it's convenient. (I just like that he is eating healthy home cooked food instead of ordering out all of the time.) The other green bag hanging on the left holds my reusable shopping bags and the one sitting on the floor (you can barely see the corner by the watermelon) usually has either glass or plastic bottles in it, or sometimes both. The Black Bin: for regular kitchen garbage. 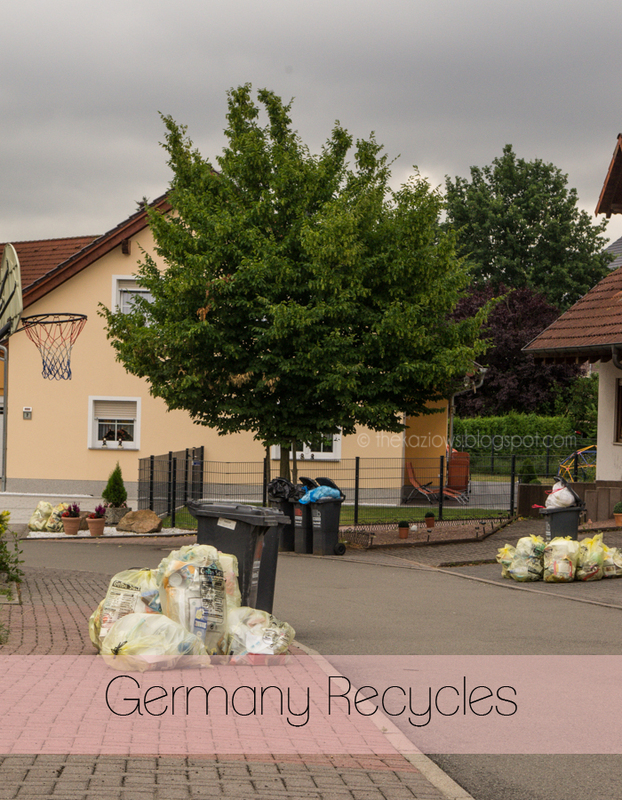 One really cool thing about the German system is that instead of paying a flat rate for garbage pick up, you pay according to the number of people in your household and the size bin you need. That's awesome for Mike and me because we've never exceeded our limit in the smallest size bin. On the other hand, if you have 17 kids, well... you pay more. I'm sure some people don't like it, but it seems fair to me. If you DO exceed your limit, there are special bags you can buy for around 3 euro or so and that cost includes the cost for pick up as well, which is nice. I see them sometimes on the streets around holidays but we've never needed one. We've never come close to filling up our Black Bin except on weeks when we forget to put it out for pick up. With 4 weeks between pick ups, we do come close to filling it up. "Full" would be approximately two 13 gallon garbage bags full. Maybe you could squeeze 3 bags in there. The Brown Bin: this is for anything "composty." Yard clippings, uncooked food. If you'd toss it into a compost pile, it can also go here. We do fill this one up frequently, especially in the summertime. If you fill up the Brown Bin and still have stuff to get rid of (maybe you trimmed back all of your hedges) there are places on the outskirts of most villages to dump yard waste. At Christmas time Mike and I go to these spots to get greenery cuttings to decorate with. The Blue Bin: Our Blue Bin is huge and it's for paper. I'm still unsure if magazines can go in there so sometimes I toss them in and other times I put them in yellow bags. I'm moving away from magazine purchases, though - yay for Pinterest!- so this is becoming less of a conundrum. The yellow bags we just store in the garage until garbage day and then set them on the street. They will pick up as many yellow bags as we set out. And yellow bags ("gelbsacs") are free from the Rathaus (City Hall). We also have a composter in the very back of our yard, but I am still unsure how to use it so I mostly don't. I've bought a couple of books and will learn more about that. It's definitely something I want to try. So that's pretty much it for the way they do things around here. An average two week period for us produces 2-3 yellow bags and not even a whole regular garbage bag of waste. I think we have more recyclables because I mostly buy American groceries and they have much more packaging. German manufacturing companies are assessed fees partly based on how much packaging they use for their products, so you don't get little things like wax paper between your cheese slices. How fantastic is that?! I love corporate responsibility! I still don't really know the garbage pick up rotation. I had it down for a while but they changed it so I'm lost again. I just watch to see what my neighbors are doing. Mike mostly puts the garbage out if he's home- so thankful for him! He's way smarter than me. OH! I forgot about the glass and plastic bottles! We don't have many plastic bottles, but the ones we buy in our village have a little symbol on them. Those we take back to the store, put them in a machine and it gives us change back for each one we turn in. It's fun on yellow garbage day to watch the pick up men sort through the yellow bags and pull out bottles they can turn in for change. Over about 4-6 weeks we might get back 3-5 euro in change but we don't buy sodas and we mostly drink tap water. If you buy a lot of bottled water, though, I bet it really adds up! The glass has a drop off point in the center of our village. We just load it up and take it as often as we need to. This varies for us. We usually have to go immediately after having people over (those wine bottles take up a lot of space!) but sometimes I'll have one random glass jar sitting for months until I find another use for it. That's our Standard Operating Procedure for Recycling in this house. We do other random stuff, too, but I think maybe that's a different topic for a different day. I could go on and on about what being a military spouse has taught me about home goods and the joys of living simply. I also love looking at all of Germany's innovative products that help make garbage management easier. Every home store has a whole section dedicated to garbage. That's amazing to me. We don't own any of it because, for us, simpler is better, but it's fun to look at. Or check out IKEA- either in person or online. They usually have a HUGE selection of options available. Disclaimer: I have an Amazon Associates account so if you buy anything I link to on this blog, I might get a small commission at no additional cost to you. I do not link to random things - only to products I've tried and liked or something I would be willing to try myself sold at a price I would be willing to pay. Maybe I get too excited about garbage, but I really like recycling. I think it's a great way to help a little bit with the planetary burden we're creating. I love how easy Germany makes their recycling program and really wish more cities in America would get on board. It just makes me feel good to take care of our earth even if it's just a little bit. All of that aside, I'm still not quite ready for his-and-hers matching Prius's just yet! I mean, that Land Rover is seriously fun! That was great Katrina! About the compost pile. I got a compost tumbler a few months ago...... I cannot seem to get it right. It is a very delicate and seemingly impossible undertaking. Some days it looks like Mississippi River mud (and smells like it too), and other days it is a dry clumpy mess. So, if you venture into this I hope you have far more luck than me! I want a compost tumbler! I've been eyeballing them for a few years now and it's always on the "when we pcs" list, but truthfully- it terrifies me. It seems like a science experiment that could go terribly wrong.